HandsOn Connect makes it quick and easy for you to create a new volunteer opportunity. After you create the opportunity, it will be sent to your system administrator who will review and publish the opportunity. Go to Volunteer Opportunities menu and Click on "Create Volunteer Opportunity"
The red * indicates that a field is required. Most fields are self explanatory or have a green ? help icon which provides further explanation. Opportunity Name - (the name of the opportunity as you wish it to be appear on the website. Good clear names make a difference! (i.e. "Arts and Crafts with Kids" is a better opportunity name than "Volunteers Needed"
Schedule Type and Registration Type - see this article for a full explanation on the four types of opportunities that can be created based on these two characteristics. Description - this is the text that describes the opportunity in detail. You can use the WYSIWYG editor to style the text (very similar to how you would in a word processor), and can even upload and add images. Keep things as simple text unless you're somewhat familiar with working on website content. But its a powerful tool if you are familiar with creating html through a web editing tool like this WYSIWYG editor. Opportunity Coordinator - select the name of the member of your staff (usually you!) who will be in charge of the volunteers, confirm their participation (if using 'express interest") and report attendance after the project. (If you need additional staff members to be opportunity coordinators, you can request that they be added as opportunity coordinators using the My Organization / Create Organization Contact option. How many of the following fields will appear in your portal depends on your organizations configuration and what info is provided on the website. 6. 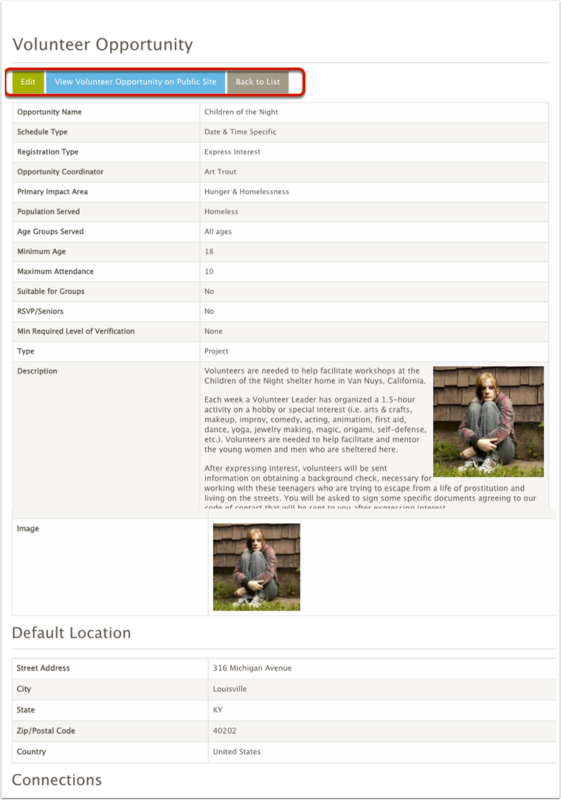 Image - if your organization is 'featuring' opportunities on the site home page, you may be asked to upload an image for the volunteer opportunity. This image must be square. (It is separate from any image that you may have entered in the project description, and only used in the "Featured Opportunity" portion of the website, if it is enabled. 7. Primary Impact Area - select a value. 9. Age Groups Served - By default, "All Ages" is preselected for you - but if your project only benefits certain ages, then you can change the selection here. 10. Minimum Age - what is the youngest volunteer that can sign up for the opportunity? (Note: In some sites there are two separate age fields. Minimum Age is the minimum age to sign up, "Minimum Age with Adult" is a way to say that a young person can volunteer, but only if accompanied by an adult. If only the minimum age field is presented, the minimum age and minimum age with adult will be treated as the same age. 11. Maximum Attendance - This field only appears for Date & Time specific opportunities. It is the maximum number of volunteers you want to sign up before 'closing' the opportunity to further signups. Any volunteers who try to sign up after the maximum attendance has been reached, will have the option to join a waiting list and be notified is space is available. 12. Suitable for Groups - a search field for finding projects that are well-suited to groups. 13. RSVP/Seniors - a search field for finding projects that are well-suited to seniors and RSVP volunteers. 14. Type: if this field is available, its used to indicate if the opportunity is a volunteer service project, or an "Activity" If you select 'activity' then you'll be asked to specify the activity type. Activity Types include: Training, Recognition Events, Socials, etc. 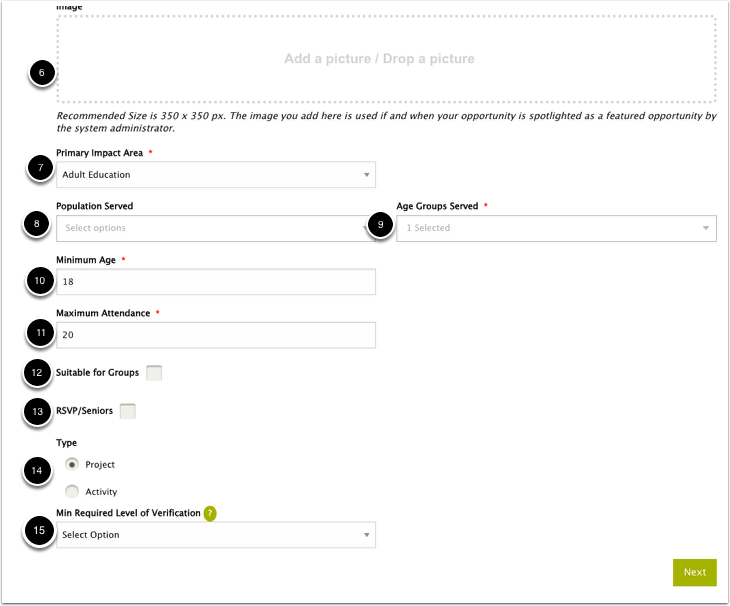 15: Minimum Required Level of Verification: Nextthis field only appears if your organization has enabled background checks via Verified Volunteers. The field "Location Name" may not have been activated in your sharing portal. If it is not present, please contact your system administrator and request that Location Name be added. 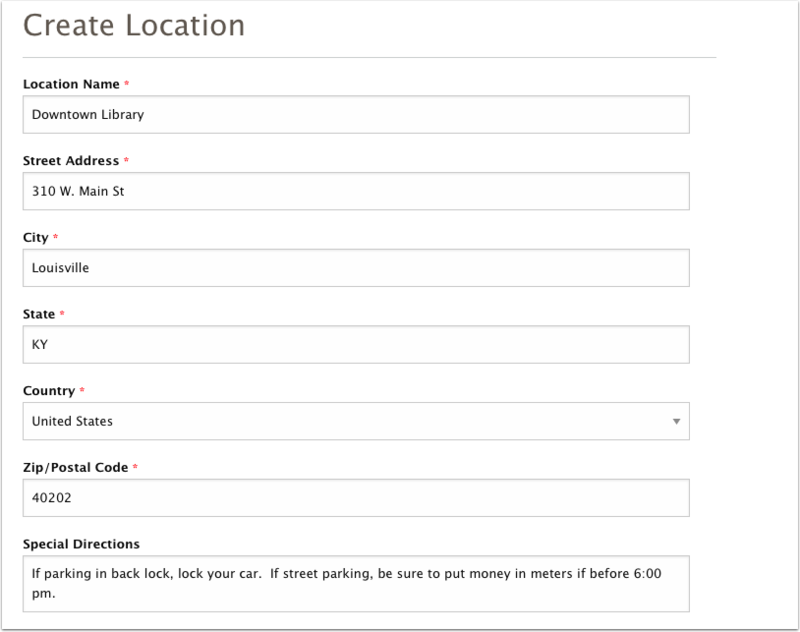 (This field allows you to identify a building or location by name. If the field "Location Name" is hidden in your sharing portal, then the Street Address will be used as the location name for your location. The final step in creating an opportunity is to set dates for it. The process varies depending on what Opportunity Type you have selected in Step 1. Because date and time specific opportunities can take place on one or more dates (occurrences), you'll be asked whether or not the opportunity occurs on a regular schedule. If no, then just enter the Date and Start and End Time. 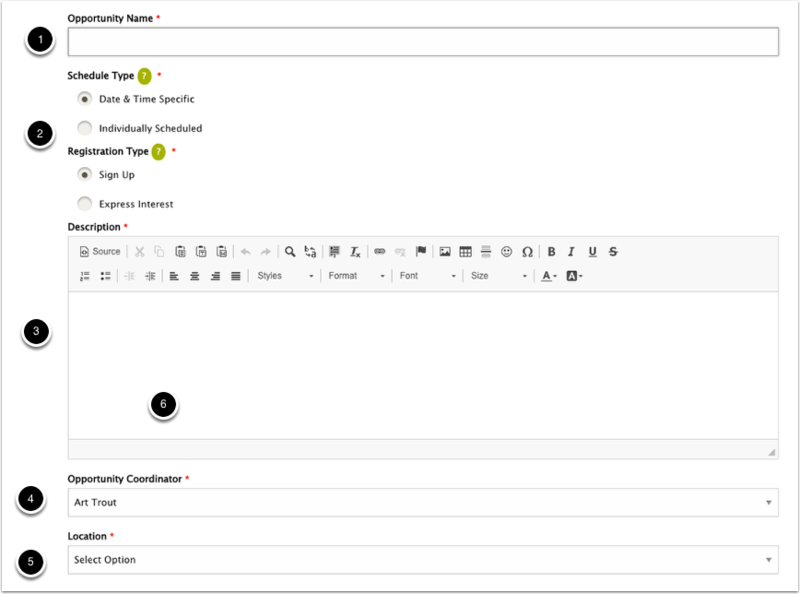 You can also Create Additional (non-regular) occurrences, for additional dates by clicking on "Create Additional Occurrences". When you are done entering your date(s), click on "Create". This would create separate occurrences for the 2nd friday in September, October, November ..... through March. 7 different dates (occurrences) that volunteers could sign up for to attend. For this opportunity type you are requesting that volunteers sign up individually, at times when you need volunteers. Start Date and End Date - this is the period of time the opportunity will be posted, and when you are open to having volunteers express interest in volunteering with you. Day of the Week / Start Time / End Time -- for each day you need volunteers, you can set the time range that they can express in. Pick a day of the week, a start time and end time, and then click "Add Day & Time" to add it as a schedule item. 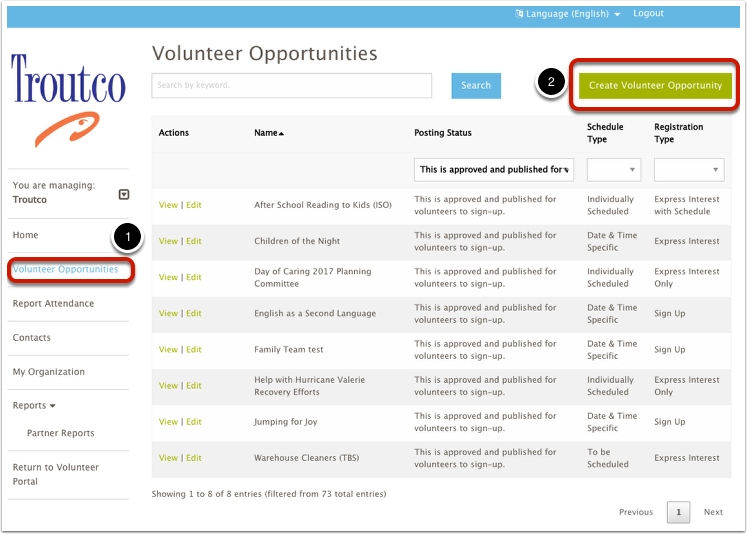 You can add multiple days and times as desired so that volunteers will only express interest during the times you need volunteers. Click Create to finish posting the opportunity with the appropriate schedule of when people can express interest in volunteering. In the schedule shown below, we want volunteers for any time they are available betweeen 9 am - 11 or 2 pm - 4 pm on Mondays.... and anytime between 9 and 5 on Thursdays. (Remember: In this opportunity type - volunteers can sign up for any start and end time WITHIN the schedule you've posted. For this type of opportunity, volunteers do not say when they want to volunteer. You are just getting a list of who is interested! After you have set the date(s) for any of these opportunity types, click Create and your opportunity will be created! 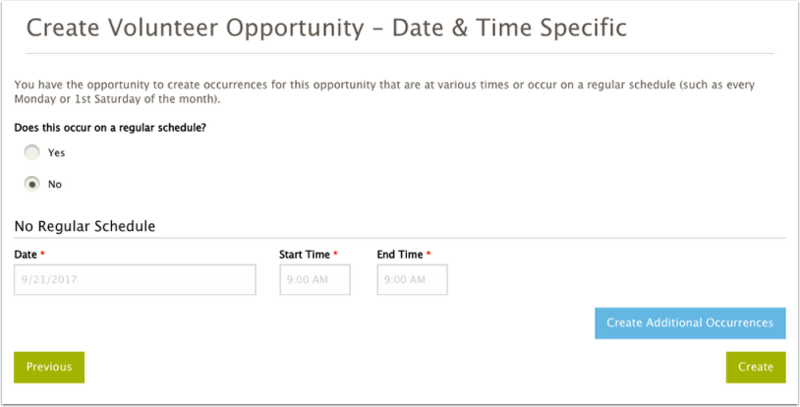 For Date and Time Specific Opportunities it will also create multiple occurrences if you've specified them. For Individuall Scheduled Opportunities there is only one occurrence record, which is used to record the participation of all volunteers who express interest. After you've created it - you'll be taken to the Volunteer Opportunity Detail Page where you can see what you've created. If you need to make changes, click on the Edit Button. The opportunity will be sent to your system administrator for approval, and then it will be published and available for volunteers to sign up. To see what the opportunity will look like when published click on "View Volunteer Opportunity on Public SIte" (the public site preview will not show the occurrences until the opportunity is published. 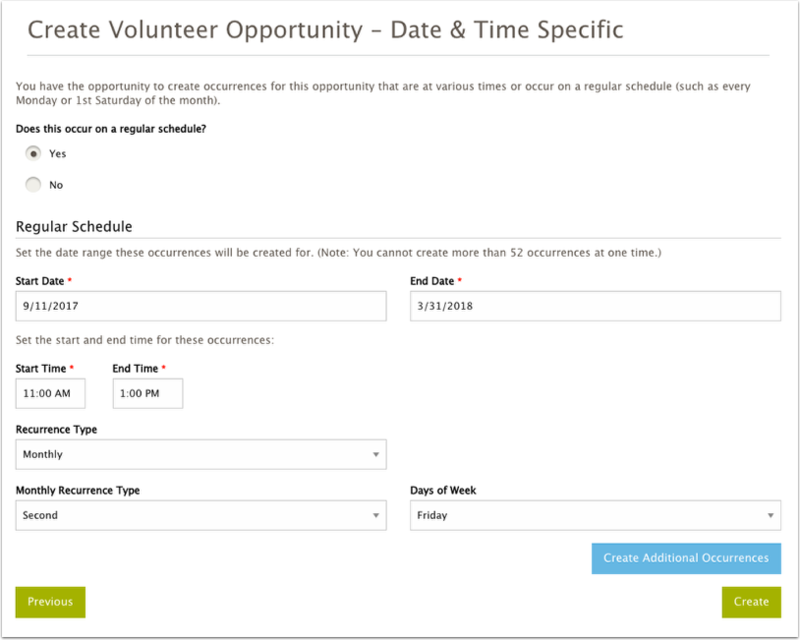 To go back to the Volunteer Opportunity page to search for a different opportunity or create another new one, click on "Back to List"
The most important decision in creating the opportunity is the Registration Type and Schedule Type. These cannot be edited and changed after the opportunity has been created. So make sure you've decided on the right type of opportunity before you create it. See this article for information on each of the opportunity types and what they are best used for.